Letting lawn die does more harm than good. While a golden brown lawn is seen as a badge of honor to some residents of drought-stricken California, in fact, they are doing more harm to the environment than good, says UC Agriculture and Natural Resources turf expert Jim Baird. Baird developed a keen appreciation for turf as a teenager playing golf and later working at a municipal golf course in Pueblo, Colo. “I found my passion,” he said. “The rest is history.” He earned a bachelor's degree in horticulture, a master's degree in agronomy, and a doctorate in botany, all the while focused on turf. Baird's research and the lawn in front of his own Riverside home show that turf can be kept alive, and even attractive, with a minimal amount of water. And maintaining lawns rather than letting them die or replacing the grass with synthetic turf, concrete or so-called drought-tolerant plants offers important ecological services. As anyone who has enjoyed a picnic in the park can attest, grass is cool. In contrast, the surface of artificial turf has been found to reach 180 degrees on a hot day. It often must be cooled with water before it can be used for sports. 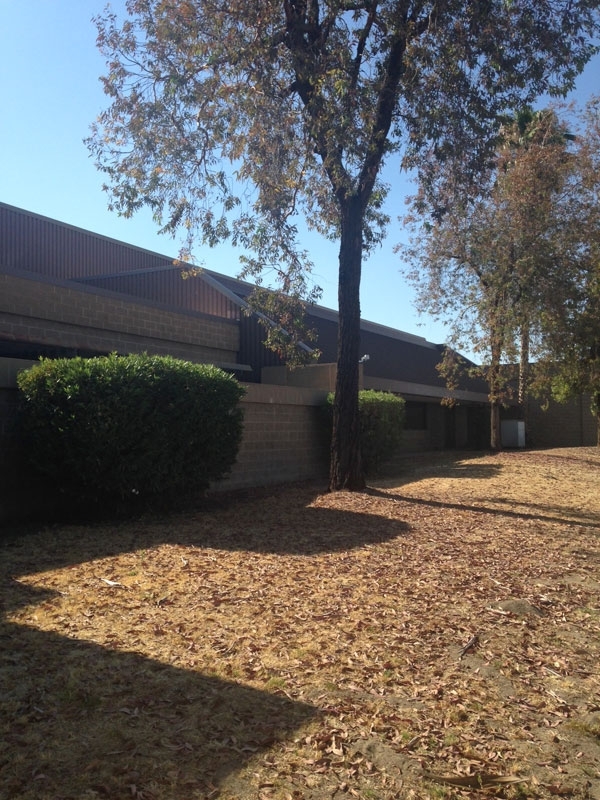 Bare soil, concrete and asphalt get significantly warmer and hold heat longer than a grassy lawn, which functions like a natural evaporative cooler. 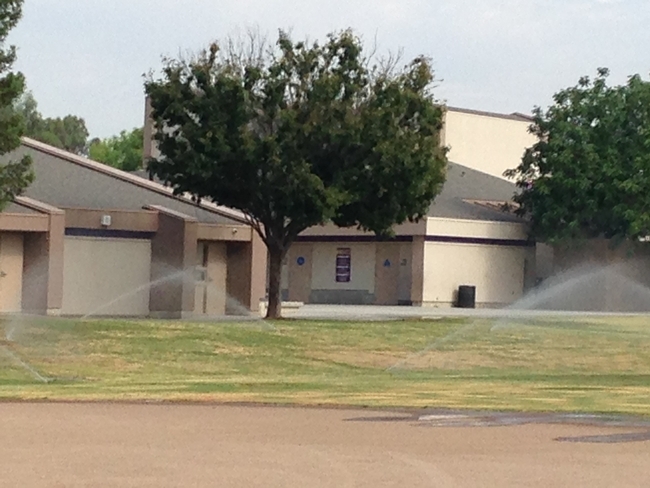 “The more we let our grass lawns die or go away, the hotter it's going to get,” Baird said. Grass, like all plants, absorbs carbon from the atmosphere and sequesters it in the soil, a vitally important quality as the country searches for ways to slow global warming. The production of plastics to make artificial turf has the opposite impact. And after a decade or so, artificial turf will wind up in the landfill, where it could take hundreds of years to decompose. Grass provides food and habitat for birds and small mammals, with the abundant insects, spiders and worms living among the blades and below the surface. Unlike concrete, asphalt and hard-packed earth, properly maintained turfgrass is porous, allowing water to infiltrate when it does rain, rather than sheeting off the surface and into storm drains. 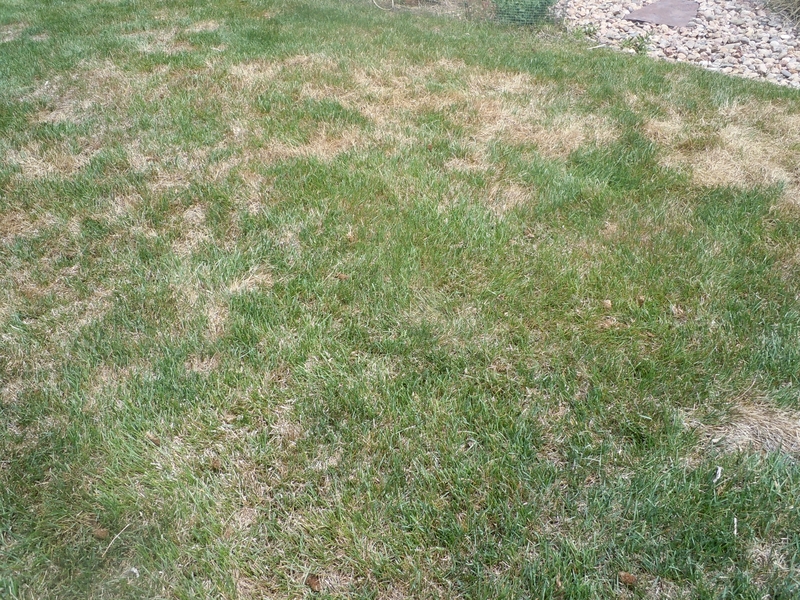 Soil erosion and dust are also reduced or eliminated with grass lawns. With all these benefits, Baird is dismayed to see the abundance of unnecessarily dead and dying lawns in California. The loss of green growing grass is an ecological loss in the short term, and difficult and expensive to revive once the drought ends. “A dead lawn could come back as nothing but weeds,” Baird said. He and his UC ANR colleagues wrote an eight-page publication on managing turfgrass under drought conditions that will help homeowners and lawn managers keep their lawns alive with minimal water. The publication outlines the concept of deficit irrigation, a system in which the grass has just enough water to maintain an adequate appearance, but with less growth. Irrigation can be cut back to two times per week. 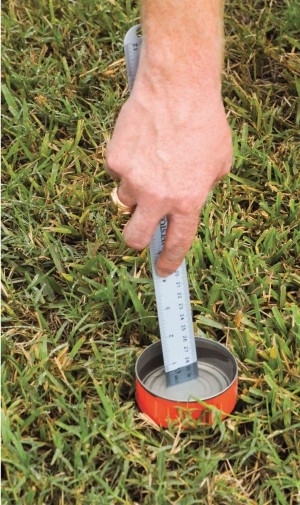 If the blades spring back after being walked on, the lawn doesn't need more water. 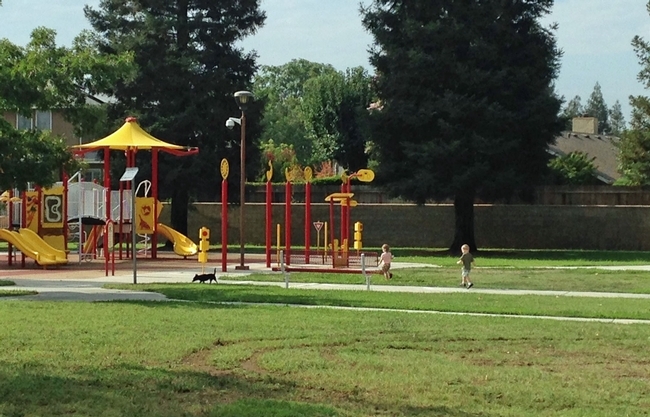 “The grass may not be as lush and green as usual, but you can still have a lawn where kids and pets can play and families can enjoy outdoor barbecues,” Baird said. Mowing practices also impact the lawn's water use. The grass should be maintained at the tallest height recommended for the species being grown to encourage development of deep roots. 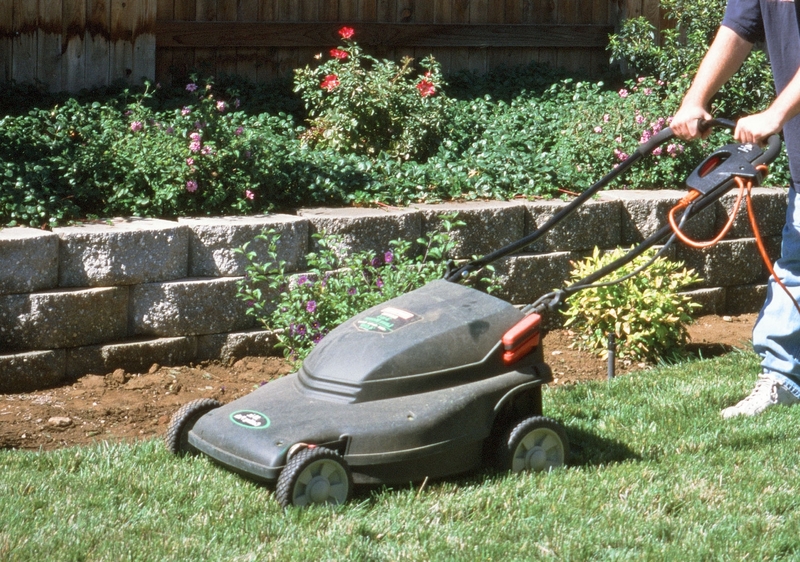 Leaving the grass clippings on the lawn with a mulching mower will reduce evaporation from the soil surface. A pdf version of Managing turfgrasses during drought, which includes grass species recommendations, is available for free download from the UC ANR online publication catalog. For professional landscapers and home gardeners interested in detailed turfgrass research information, UC ANR is hosting a Turfgrass and Landscape Research Field Day Sept. 17. Registration is $90 before Aug. 28, $100 on or after Aug. 28 and $120 onsite. The complete agenda, registration form and previous research reports can be found on the field day website. The fourth winter in a row of disappointing precipitation has triggered a die off of trees in the Sierra Nevada, most of which is now in ‘exceptional drought' status. The US Forest Service conducted aerial monitoring surveys by airplane in April 2015 and observed a large increase in tree mortality in the Southern Sierra (from Sonora south). Surveyors flew over 4.1 million acres of public and private forest land and found that about 20 percent had tree mortality on it, totaling over 10 million dead trees. The Forest Service found severe mortality in many pine species especially ponderosa pine. On private lands along the foothills of the Sierras, surveyors found extensive areas of dead pines. 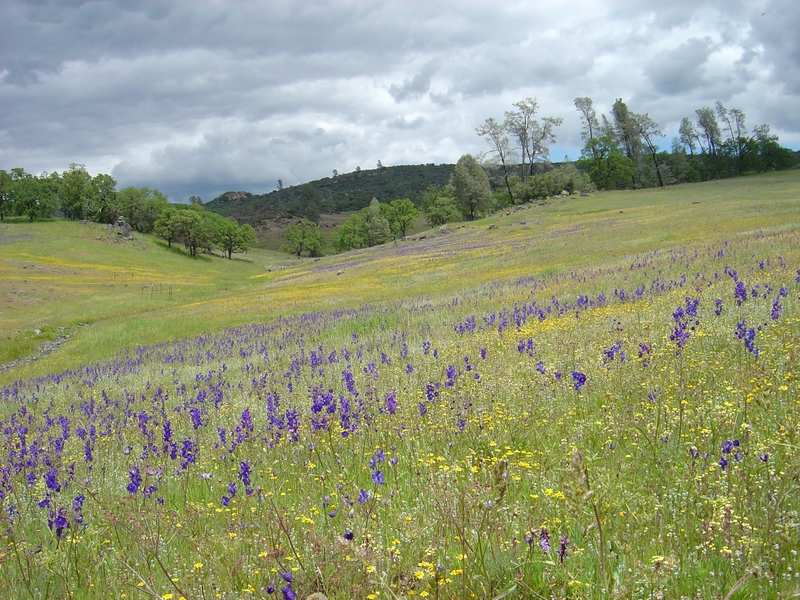 Large areas of blue and live oak mortality were also suspected though it was too early in the season to be sure. On the Stanislaus National Forest, areas with dead trees doubled since last year. Pine mortality, mostly caused by western pine beetle, was common at lower elevations. Over 5 million trees were killed on the Sierra and Sequoia National Forests up from the 300,000 trees killed last year in the same area. Conifer mortality was scattered at higher elevation, though surveyors note that the survey was conducted too early in the year to detect the full extent of mortality levels. The insects killing trees in the Sierra are all native insects that are multiplying because of drought conditions. Native insects are a necessary part of the forest ecosystem that speed decay of wood back into nutrients, prey on other insects, and provide food for wildlife. They are normally present at low levels and cause tree mortality only in localized areas. However, drought weakens trees and reduces their ability to withstand insect attacks. Normally trees use pitch to expel beetles that attempt to burrow into the tree through the bark. Weakened trees cannot produce the pitch needed to repel these beetles which are able to enter under the bark and lay eggs. Larvae feed on a tree's inner bark cutting off the tree's ability to transport nutrients and eventually kill it. Attacking beetles release chemicals called pheromones that attract other beetles until a mass attack overcomes the tree. Many beetles also carry fungi that weaken the tree's defenses. Western pine beetle is one of the main culprits killing pines in the Sierra during this drought. It is a bark beetle, one of a genus of beetles named Dendroctonus which literally means ‘tree-killer'. Adult beetles are dark brown and about a quarter-inch long. Adults bore into ponderosa pines, lay eggs which develop into larvae in the inner bark then complete development in the outer bark. When beetle populations are high, such as during drought periods, even healthy trees may not be able to produce enough pitch to ward off hundreds of beetle attacks. 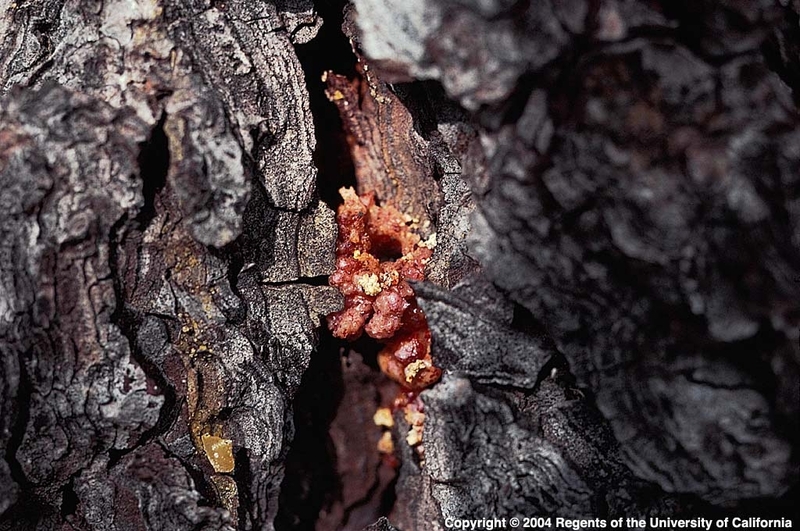 Western pine beetle often attacks in conjunction with other insects. 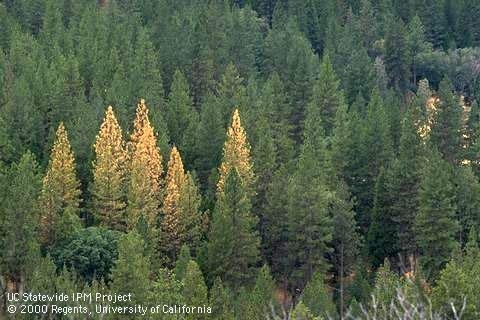 Other beetles causing tree mortality in Sierra forests include mountain pine beetle, red turpentine beetle, Jeffrey pine beetle, engraver beetles (Ips) and fir engravers. Forests with a higher diversity of tree species are typically less affected because beetles often have a preference for specific tree species. Some species may attack only one tree type. For example Jeffrey pine beetles attack only Jeffrey pine. Signs that bark beetles are affecting a tree include pitch tubes (streams or tubes of pitch visible on the trunk), small holes through the bark, or boring dust. If the tree is extremely water-stressed and cannot produce pitch, boring dust may be the only visible sign. Trees with needles that have turned from green to red are dead. Most beetles have emerged by the time trees turn red. The best defense against bark beetles is to keep trees healthy so they are able fight off insects themselves. Widely spaced trees are typically less susceptible to successful attack by bark beetles since they face less competition for moisture, light, and nutrients compared to densely growing and overcrowded trees. Forest health can be promoted by thinning to reduce overcrowding (so each tree has access to more resources) and removing high risk trees during thinning (such as those that are suppressed or unhealthy). For landscape trees of high value close to a home, watering may be one option to increase tree vigor against bark beetle attacks. Apply about 10 gallons of water for each inch of tree diameter (measured at chest height) around the dripline of the tree once or several times a month during dry weather. There are some insecticides registered for bark beetle control, but all are preventative only. Carbaryl may prevent attack for up to two years, while pyrethroids can deter attack for up to a year. Spraying can be tricky because the chemical must be applied up to 50 feet up the trunk of the tree usually while standing on the ground. Since misapplication may have toxic consequences, any insecticide must be administered by a licensed pesticide applicator. All applications must follow the label. Though some systemic treatments applied to the soil or inserted into the tree may work in some cases, there is not a lot of documented evidence that they are effective against western pine beetle. No insecticide can prevent tree death once a tree has been successfully attacked.